It's cold, it's dark, it's raining - and it's Friday night... Let's go fishing!! Myself and Dan are quite, quite mad. We popped down to the Wandte for a couple of hours trying to add to the barbel challenge total before heading to the pub, but as we couldn't tear ourselves away we missed the 12 o'clock last orders by over an hour! We explored some new water with only one decent bite. 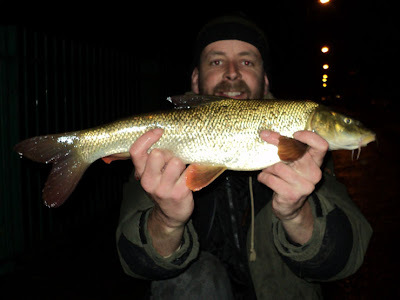 A 3lb 1oz barbel on a hair-rigged halibut pellet. Dan's luck hasn't really been in yet this season, but we're only ten days into it. The challenge now stands at twelve barbel for 16lb 11oz, we need to land some bigger fish! In Poland we fish for the biggest barbels >8lb with small crankbaits like Salmo Hornet 4. Big Barbel is a predator and it won't miss small affraid fish swimming next to it. Hi Jarek, Couldn't really use crankbaits in the Wandle as it's so full of snags - It would cost a fortune in lost lures. I am going to try cheese though. Cheers Paddy, the fish that saved the night, would have been pretty rubbish getting soaked for nothing! Definitely fishing the wrong spots, head downstream from Plough Lane. No one individual spot to recommend as they are quite numerous. Someone has been ever so kind and cut a few out on the steeper sections as well. Had a brace at 7lb2 and 5lb4 last friday and the chap fishing next swim on managed a 9lber. Darren you never popped back to see how i was getting on the other day. See you soon i imagine. Weather not fantastic for barbel fishing this week so good luck if you go out. Nice fish. Sounds like some networking may show you the way to bigger fish. Nice to see anglers sharing information. Thanks guys. I've had a look at Google Earth and I'll be heading downstream next time. See you on the riverbank soon. Cheers.